Controlled Substance Ordering System (CSOS) is part of the Drug Enforcement Administration's (DEA) E-Commerce Program. It allows veterinary practices to order controlled substances without the supporting paper 222 form. Learn more about CSOS in the DEA's website by clicking here. 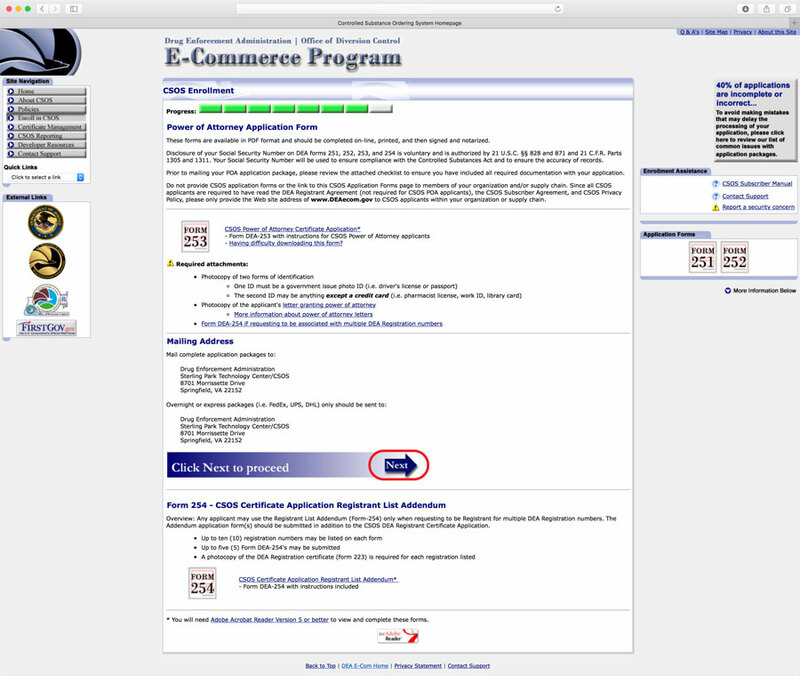 Go to the DEA's E-Commerce program by clicking here or type http://www.deaecom.gov/csosmain.html on your browser. Click Enroll in CSOS link. You are now on the Getting Started page. After reading the information, click Next to proceed. Choose your Applicant Type. In this scenario, we will simulate completing the Power of Attorney. Read the information and then click Next. Carefully read the Subscriber Agreement and click Accept. This will take you to the actual application form. Download the file by clicking 'CSOS Power of Attorney Certificate Application' and a PDF file will open. Fill in the form before printing so all the information on the form is typed. The last two pages are a checklist for you to make sure you have everything for the CSOS application. After completing the form online, print the application. Sign and date where indicated. Go over the checklist to confirm nothing was missed. Then, mail it to the address indicated. Go back to the Power of Attorney Application Form page and click Next. You will be taken to the 'What's Next' page. This is an informational page providing you details on the process. You should receive your Online Certificate within 4-6 weeks. After receiving this information, please call our Compliance Department (1-800-399-VETS) to complete your setup in our system. If you need further assistance, we'll be happy to help. Call 1-800-399-VETS or email customerserviceteam@amatheon.com.